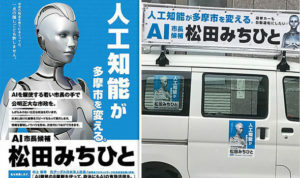 The robot’s campaign is plastered across vehicles in the west Tokyo city. The robot, with an all-silver body and what appear to be female features, has been nominated to run for mayor of Tama City in west Tokyo against a slate of high-ranking local politicians. The robot candidate also promises to analyze petitions put forward to the city’s council, statistically breaking down the positives and negatives of the petitions, according to a report by Otaquest. Citizens in Tama City would not vote for the AI Mayor, as robots cannot technically run for office, but will instead vote for the human, Michihito Matsuda, who came up with the idea of a robot mayoral nominee. Matsuda said the robot would, as mayor, be capable of taking in the dialogue and wishes of residents before calculating the best course of action.